This perennial species is unusual among the coneflower species as it has yellow flowers as opposed to the more common purple colors. Coneflowers were used by Native Americans for a variety of medicinal purposes including cure of rattlesnake bites and as a painkiller for toothaches, sore throats, coughs and other ailments; anyone who has chewed on the seeds can vouch for the numbing properties. Research has verified coneflowers to have mild antibiotic activity, wound healing properties, and perhaps it is most well-known for the ability to stimulate the immune system (Medicinal Wild Plants of the Prairie by Kindscher); root digging for pharmaceutical use has decimated many wild populations. This species is also called Bush"s Coneflower. The Latin name, Echinacea, refers to the spiny cone"s resemblance to a hedgehog while paradoxa refers to the paradox of a yellow-colored coneflower. The seeds of Yellow Coneflower are a favorite with Goldfinches and other birds as well as small mammals. It is an important plant for many native bee species and is used by various butterflies as well. The coneflowers are highly palatable to livestock. They are high quality forage, especially in early spring. Under continuous grazing, coneflowers are decreasers and are grazed out. 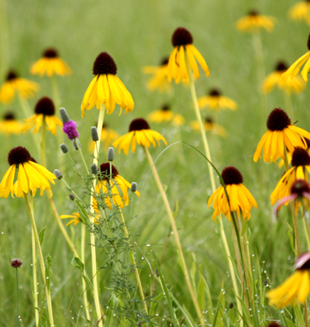 Yellow Coneflower is a beautiful addition to wildflower meadows planted on dry sites in full sun. It does well on subsoil that has been limed to correct any acidity issues. It is not aggressive and "shares well" with other plants. It is a pretty partner to Pale Purple Coneflower, New Jersey Tea, Purple & White Prairie Clover, and the earlier blooming Wild Bergamot. The flowers make beautiful cut flowers. Folks report this species to be deer resistant. This species is native to the Ozarks, especially the western part. It is found on limestone and dolomite glades, upland prairies, and savannas. It works well in restorations on dry, full sun sites.